Photo: VTDEC. Drawing: University of Florida/IFAS Center for Aquatic and Invasive Plants. 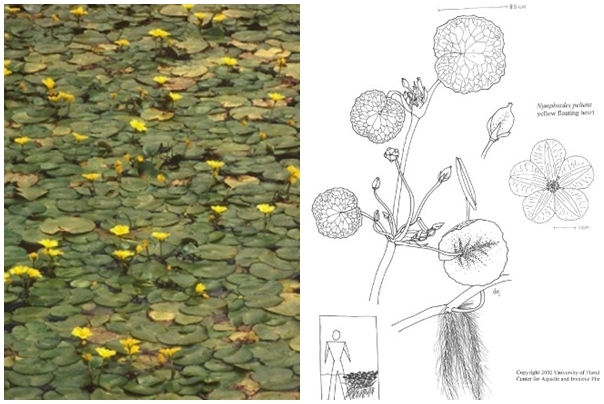 Yellow floating heart is a rooted aquatic plant. Clusters of leaves distinguish it from native heart-shaped floating leaf plants which never have more than one leaf per stem. Flowers, resembling squash blossoms, are bright yellow with five fringed petals. Yellow floating heart was introduced to North America from Eurasia in the 1940s as an ornamental pond plant. It grows in slow-moving streams, ponds and lakes up to a depth of four meters. Its dense growth can tangle swimmers, fishing tackle and boat motors. It spreads by seed and by floating fragments.